New for 2018 is our mirrored bar, it is a very modern addition to our range but has proven to be a very popular option. Like all our bars the mirrored bar is available on either a wet or dry hire service. Our dry hire bar service is perfect for anyone looking for a stunning looking bar for their event without the staff or alcohol. However for a small fee you can book this bar on a full bar service. Included in our full bar service is a wide selection of drinks, fully trained bar tenders, payment and voucher systems, free glassware and refrigeration to keep your drinks nice and cool. 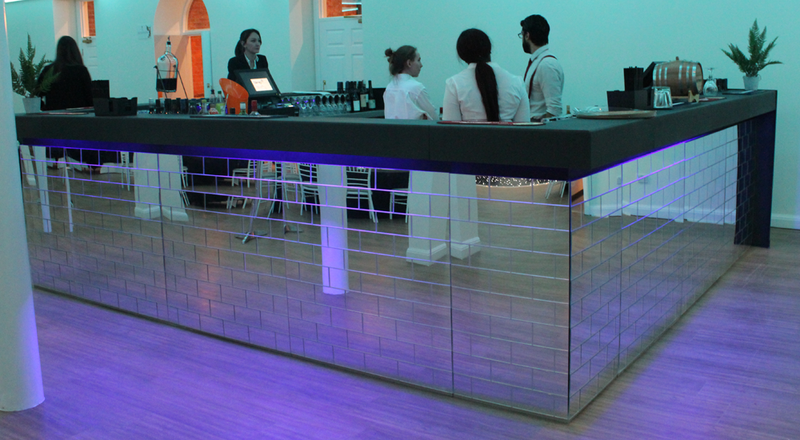 Our mirrored bar can be supplied in as many sections as you require. The individual sections can be placed together to create a range of different layouts including, U shape bars, corner bars or a spectacular island bar.